You are here mainly because you cannot access your website dashboard or the website login page. Or maybe your WordPress website isn’t behaving the way it previously used to and if you are witnessing anything like this, then it’s probably because – Your WordPress site is down”. Okay, My WordPress Website Is Down! Now what? But you don’t have to worry as there should a simple reason – Why your WordPress website is down for the time being. We have mentioned short preliminary checklists that should very much help you in keeping your head cool and will let you know why your WordPress site is down and how to fix this issue almost immediately! The best part is that you can conduct all these preliminary checklists on your own (before you ask you for help with your WordPress Hosting support team). Quick Fix: When And Why Is The WordPress Website Down? Here are the 10 different preliminary checklists to find out – If your WordPress website is down only for you or for others too? Not to forget this basic step where you have to ensure that you have all your network connections are properly plugged/connected to the ports or sockets. I know this sounds silly! Just make sure that your internet is correctly connected to your system as you wouldn’t wish to break your head for the next couple of days just because of this. 2. Is It Down Just For You Or For Others Too? What happens often is that the concerned problem could be caused due to a common issue which ultimately affects several other users. Also, there may be several other users who are also figuring out (if their WordPress site is down or not). If you want to find out if that’s exactly the case or not, you can try a few online website status checking services such as Is This Site Down. This is online tool checks your site from multiple locations. Thus, if the problem is with your computer, you will know about it. All you need to do is simply feed in the URL of any website and you will know if that site is down too. WordPress website down: Fix it with is this site down or up? When you find out that it’s only you who cannot access your site, your next step should be using the tool named Whatsmydns. Generally, “Site not found” error or a similar error indicates that your website DNS hasn’t been updated yet. Whatsmydns tool helps you in finding this and you cannot skip this step if you have recently changed your website DNS. However, one should know that the change in DNS could take around 6 to 48 hours (or even more in some cases) to get updated. You can try forcing your web page to reload, if you find out that your website DNS is up to date. You can do this simply by clicking Ctrl+F5 (if you are a Windows user) or click Cmd+R (if you are a Mac user). This way, you can bypass your cached WordPress web pages and start accessing your web page from the server directly. Next, you can start viewing your WordPress website from other locations via proxy sites like KProxy. If you can view your website this way, it is mainly because you are witnessing some network issues. Moreover, you can even start keeping track of the uptime of your WordPress website on a continuous basis with online tracking tools like Pingdom. The domain name that you purchased while starting your WordPress site comes with an expiry date which is suppose to be renewed by you on a timely basis. Did you miss out the subscription renewal notice of your Domain Registrar? Thankfully, most of the Registrars extend the validity (for 30 days beyond the expiry date). Also, many web hosts bundle domain name registration services with hosting but if this isn’t the case, you need to check if your domain subscription for your WordPress site is up to date or not. You can head to WhoIs.ICANN.org and feed in your WordPress website URL. You will instantly find out if your domain registration is still alive or not (along with a whole lot of other domain details). If your web server is experiencing downtime, you won’t be able to access your WordPress site. You may receive a message that your website server will be experiencing downtime and sometimes you may be kept in the dark about it. Any intensive resource usage of web server resources exceeding your allotted bandwidth can cause your WordPress site to go down as well. Start checking by simply refreshing the page, and if it’s a temporary issue, it’ll most likely resolve itself. Next, you should consider if the hosting service you have selected is right for your WordPress website or not. If you have opted for cheap WordPress hosting, it is very much possible that the hosting servers on which your WordPress site is hosted on may not provide you sufficient support for best uptime (preferably close to 100%). Downtime is caused – often due to cheaper hosting which doesn’t provide enough infrastructure support (example for WordPress CMS), and the only solution to your problem is to wait it out or get on the telephone or chat with your WordPress host. The best option you can choose is – switching to a quality managed WordPress hosting solution such as SiteGround (Click here to avail 60% discount). Services like SiteGround keep you informed of any server outages providing your WordPress website the best industry uptime (99.99% uptime guarantee). You can also find the status/health of your WordPress website. Most of the hosting services suspend your hosting account if there has been unpaid invoice(s) for a while. You will usually get an email from your WordPress host letting you know when about your next payment and its due date. This ensures that your billing information stays up to date so that your WordPress hosting account suspension can be avoided. 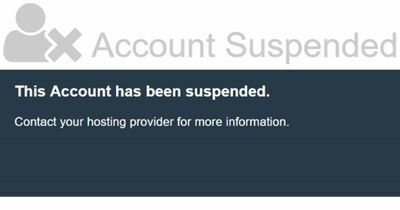 However, if you get a notification like “This Account has been Suspended”, it means your WordPress hosting account has been terminated. In this case, you can either contact your WordPress host and try to restore your website or instead migrate your WordPress website to a new host for free (if you have already saved the backups). Web Hosting Compatibility With WordPress Websites » Choose only those hosts/plans that are highly compatible to host WordPress websites. When it comes to WordPress hosting, SiteGround’s WordPress plans are simply the best. Plus, they are officially recommended by WordPress. Choose WordPress Manual Update » If you get a Fatal Error, you can opt for a manual update of WordPress. Turn Off WordPress Safe Mode » You can even try turning off the WordPress Safe Mode in your file named httpd.config and then restart Apache. Incorrect File Permissions » It is important to have proper file permissions for your WordPress site so that it wont affect the functioning of its auto-update feature. Try changing the file permissions and once you are done this process, you can try auto-updating again. WordPress Isn’t Updating Completely » Soon after attempting to update WordPress, you may face a scheduled maintenance error while you try to load any web page. This is mainly because there was a timeout prior to WordPress coming out of the maintenance mode. WordPress temporarily creates a file named .maintenance during the WordPress updating process, to notify that your website is under maintenance mode. You must remove this file from your WordPress website so that you will be able to re-access it. Some WordPress plugins and themes don’t work well together or even with the WordPress interface. This can make your site go down and simply not even allow you to connect with your WordPress website. One of the ways to prevent this kind of an issue is to only install quality WordPress themes and plugins especially from reputed websites such as Themeforest or StudioPress instead of going for malicious free nulled WordPress themes and plugins. I personally recommend you to go for Genesis WordPress theme by StudioPress as it is simple, feature-rich, SEO friendly, mobile responsive, and fast load (both in Pingdom and GTmetrix). Most of the WordPress theme/plugin authors blame other WordPress plugins, tools or themes for the current conflicts. You should instead take some time in reading their reviews before installing them from the WordPress Repository. And if you ever have in doubt when it comes to the compatibility with WordPress website, you can always inquire with the concerned WordPress developer/author. A good place to search for the list of best WordPress plugins is our own Best WordPress Plugins list (+ includes Recommended WordPress Resources). WordPress Security is a very crucial concern to mainly stay ahead of hackers. Several malicious bots often repeatedly try to gain access with numerous attempts and at times even are quite successful. Thus, having a strong password and admin area protection is important. Also, your WordPress host needs to take the responsibility to protect your website (during any DDoS attack). Many of them don’t provide this service and the best one I can recommend is SiteGround. Recovering a website which is hacked is always considered a very painful and long process, but you can prevent this by hosting your WordPress with a quality secured managed WordPress hosting company like SiteGround. It can be very distressing experience when you aren’t able to access your own website but thankfully there are numerous ways to know why your WordPress site is down. The valuable information provided in this post can help you get a solution to your problem. If you still aren’t able to handle the problem on your own using the simple peliminary checklist, you can then ask for help with your WordPress host support team. SiteGround has affordable fully managed premium WordPress hosting plans offering you insanely fast support with quick fix to any of your technical issues (giving you complete peace of mind).